The aftermath of graduate school can be particularly trying for those under pressure to publish their dissertations. 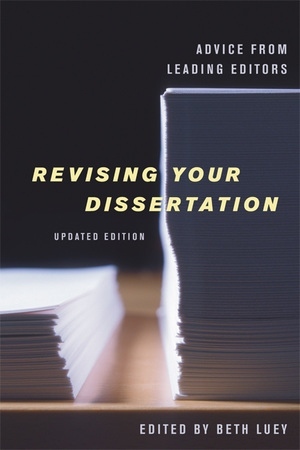 Written with good cheer and jammed with information, this lively guide offers hard-to-find practical advice on successfully turning a dissertation into a book or journal articles that will appeal to publishers and readers. It will help prospective authors master writing and revision skills, better understand the publishing process, and increase their chances of getting their work into print. This edition features new tips and planning tables to facilitate project scheduling, and a new foreword by Sandford G. Thatcher, Director of Penn State University Press. Beth Luey, Founding Director Emerita of the Scholarly Publishing Program at Arizona State University, is author of Handbook for Academic Authors and Editing Documents and Texts. Introduction: Is the Publishable Dissertation an Oxymoron?